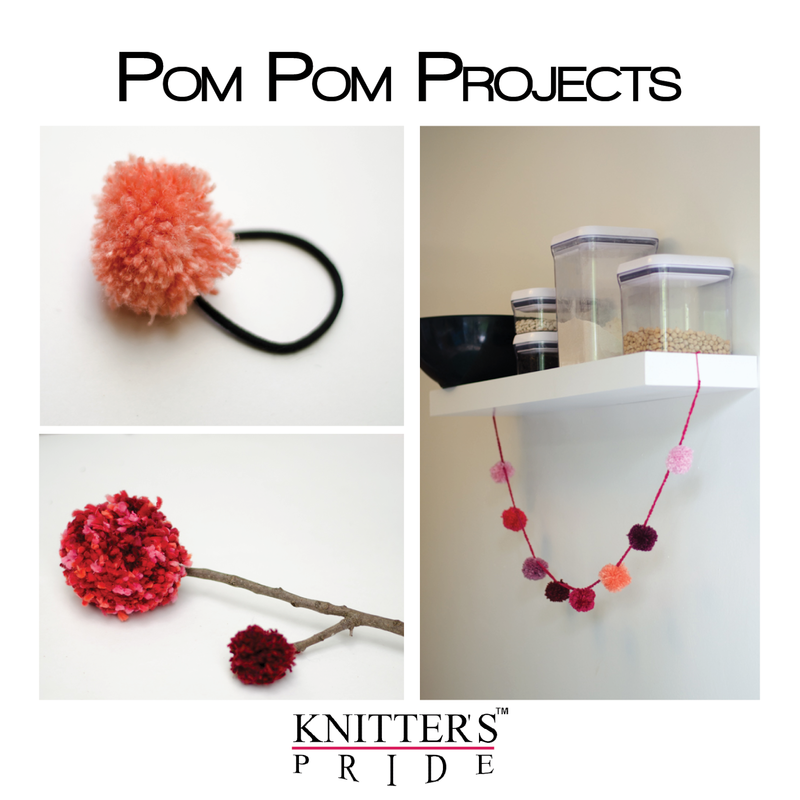 Today, we're featuring three fun craft ideas for the Knitter's Pride Rejoice and Nirvana Pom Pom Makers. 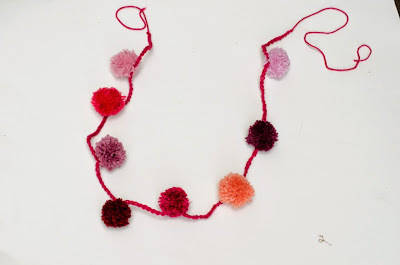 These are great crafts for using up those odd bits of leftover yarns and fun to do with kids, too! 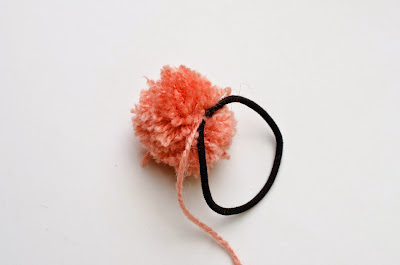 For our projects, we made larger pom poms using the 2.5"/8.5cm Nirvana pom pom maker and smaller pom poms using the 3/8"/3.5cm Rejoice pom pom maker. For instructions on how to make pom poms, take a look at this tutorial from our blog archive. Our first project is a fun summer accessory for keeping the hair off your neck! 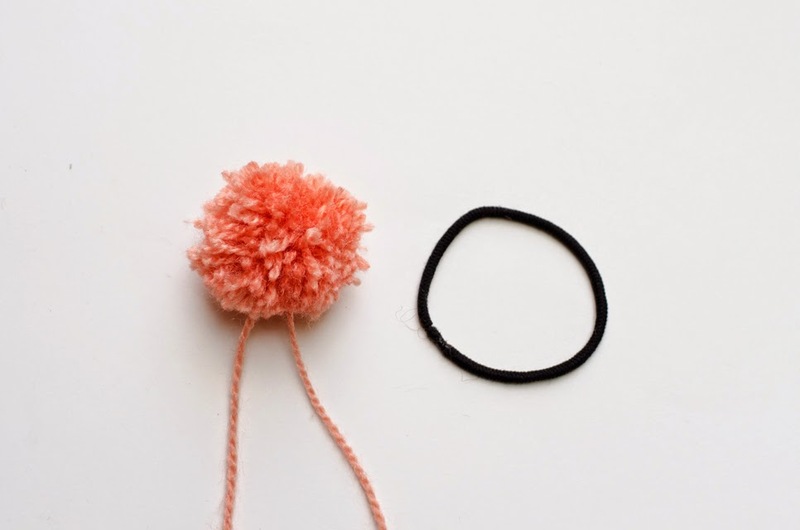 All you'll need is a pom pom in the size of your choice (we used a small one) and a hair tie. 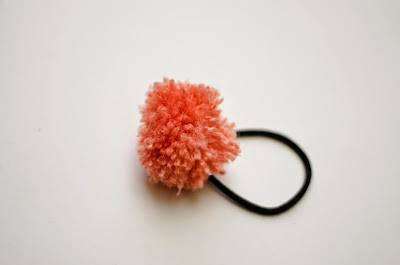 Using the tails from your pom pom, secure the pom pom to your hair tie. Be sure to wrap a few times and tie some nice strong knots so that it won't come apart. Voila, you have an adorable pom pom hair tie! Our second project is a great way to decorate your home throughout the year - and you won't have to worry about watering or wilting! 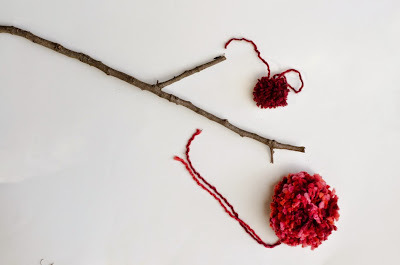 We went outdoors to source a small branch to use with both large and small pom poms (in the example below, we use one of each size, but feel free to get creative!). 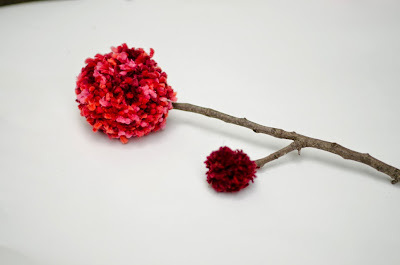 All you have to do is tie your pom poms to the branch using the tails; you can use a little craft glue to secure the ends in if you like. Using hot glue or other craft glue to secure each pom pom might be helpful with more slippery yarns like cotton. You can make several and put them in a vase for a lovely decoration! 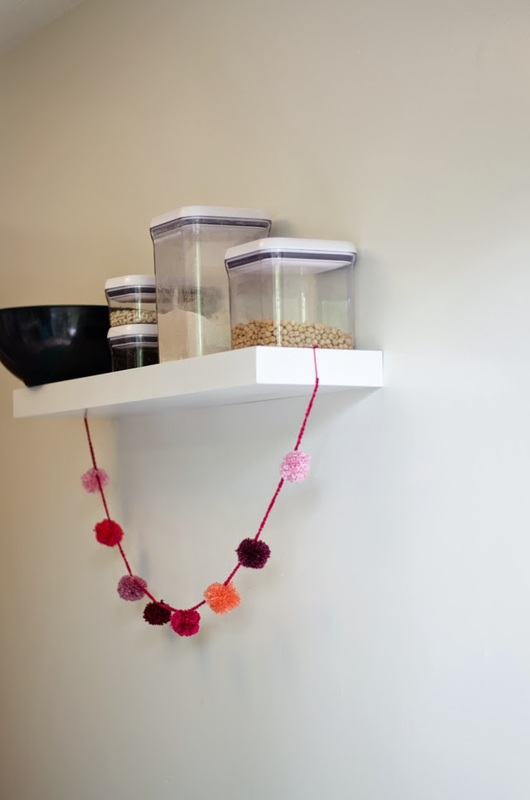 With our third project, you can add a little color to any part of your home! 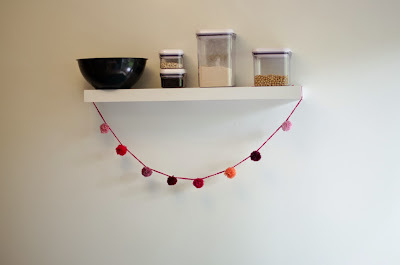 You can make your garland as long as you'd like, depending on where you plan to hang it. 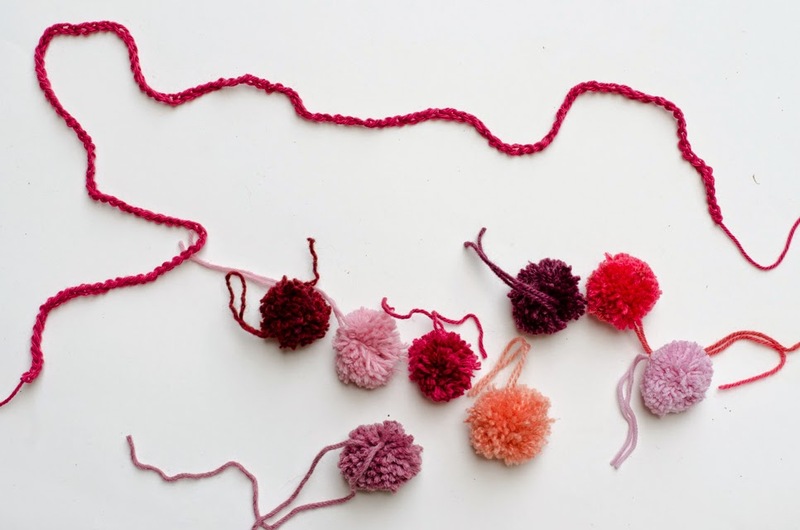 For our garland, we used 8 of the smaller pom poms and crocheted a chain approximately 4.5 feet long. 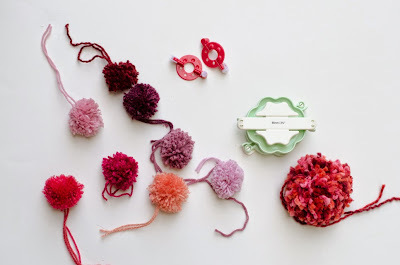 To make sure your garland comes out fairly even, fold your crochet chain in half, and arrange the pom poms in the order you'd like them to appear. 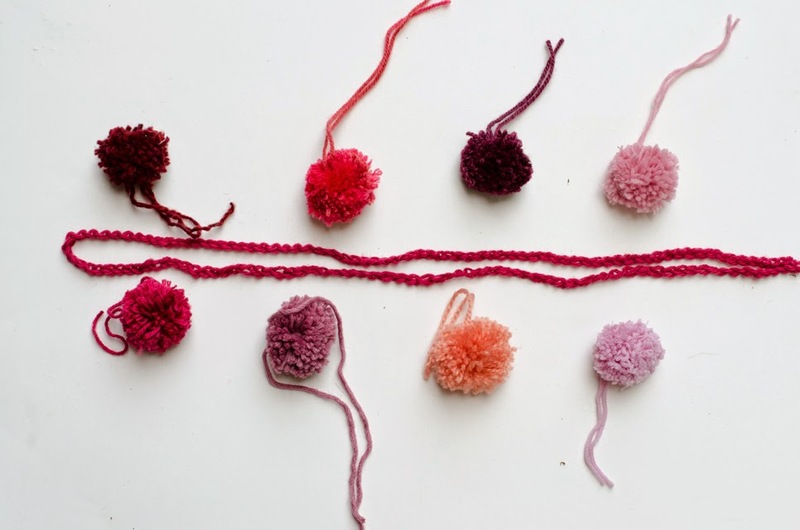 Remember that the ones at the center (on the left in the photo below) should be closer together since the crochet chain is folded. Tie your pom poms to your crochet chain and trim the ends. Now you're ready to hang your garland! We used ours to brighten up a shelf in the kitchen! 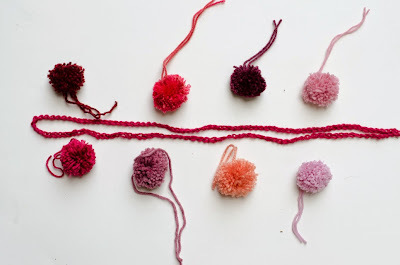 Where would you hang a pom pom garland? Congratulations to Shelley, you're the lucky winner of a Nova Platina Deluxe Interchangeable Needle Set! We'll be in touch to arrange delivery of your prize. Thanks to everyone who participated! 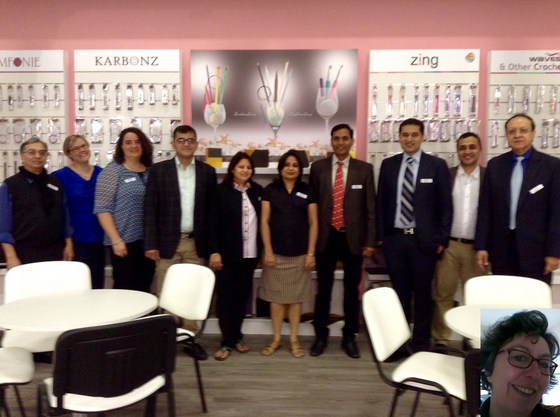 In March of this year, the Hobby & Handarbeit (commonly referred to as simply H+H) trade show took place in Cologne, Germany. 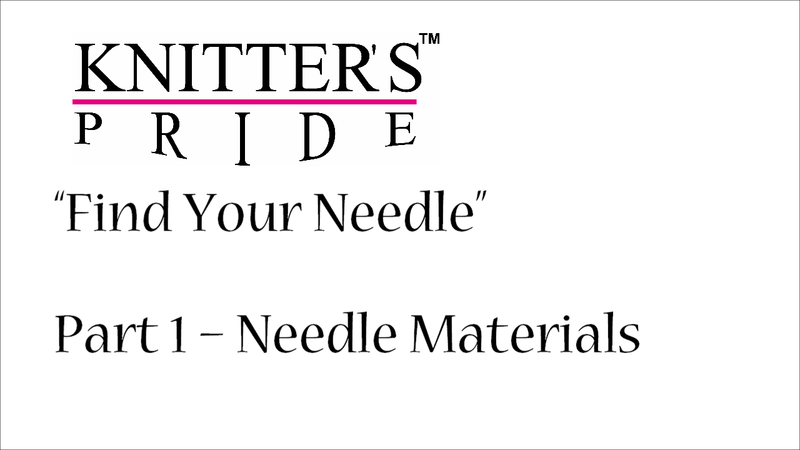 This yearly event attracts 370 exhibitors and over 15,000 trade visitors from all over the world, and KnitPro is proud to take part by exhibiting our wide range of needles, hooks and accessories for knitters and crocheters (for those of you who might be wondering, Knitter's Pride products are sold outside of North America under the KnitPro brand). 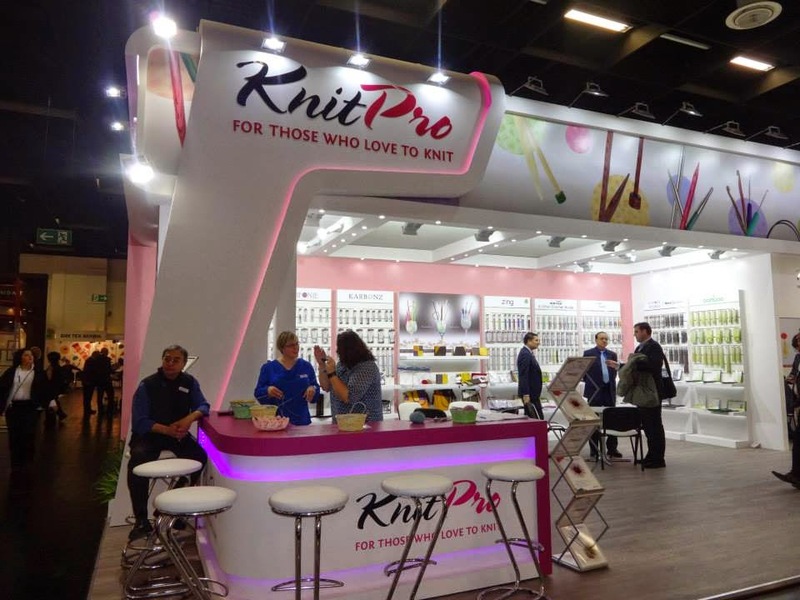 This is also when we introduce our newest additions to the KnitPro product lineup, and we enjoy getting a chance to chat with visitors to our booth each year. More recently, our needles and hooks were found at YarnCon, which is an indie yarn and fiber festival which takes place each spring in Chicago, IL. In addition to being part of the yarn tasting area, Knitter's Pride products were found in the Gnome Creation Station, which was an area where visitors could knit or crochet a small gnome toy to be included in an upcoming art installation in Seoul, South Korea. The installation will be created by Anna Hrachovec of MochiMochiland, who recently put out a call to crafters near and far to donate their gnomes for the cause, dubbed #ProjectGnomeDiplomacy. You can read more about the project here on Anna's blog; we look forward to seeing it take shape later this summer! Use the widget below to enter this month's giveaway by signing up for our newsletter (if you are already a subscriber, simply enter your email address to confirm). Click here for a direct link to the entry form if the widget does not work for you!